We all know that hosting is a costly affair. This question comes in the mind of everyone who want to start Blogging or want to have own self hosted blog. 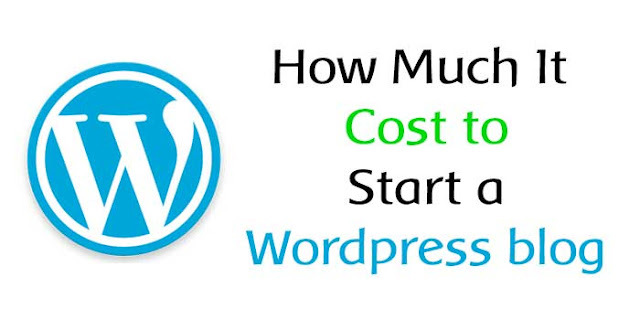 Lets answer this question How much it is going to cost to create a self hosted WordPress blog. We will discuss about the process to set up a WordPress blog. WordPress is one of the best popular CMS which comes at minimal cost. WordPress is a free software, you can download it from WordPress.org. But it require domain name, a hosting space, template, for which you pay for. There are other requirements on which depend upon your decision to spend such as SEO, customization etc. Minimal cost to start a WordPress blog is $60 for hosting and domain with Bluehost and Dreamhost. Domain is the very first thing that you need to purchase. Domain name is the address of your blog. You should choose keyword rich domain or a branded domain. When you going to buy a domain, try to get .com or .org or .net. Here is the cost to buy different from different services. Note: Bluehost hosting package provide one free domain. Webhosting is a major investment to start self hosted WordPress blog. Never compromise with quality of Hosting. Always get affordable and reliable Webhosting. I recommend shared hosting for new blogs. Below are the best hastings for wordpress on annual basis. You can find many resources or tutorials to setup WordPress Blog available on Internet. WordPress themes,, but I recommend to choose premium WordPress theme. Elegant themes or Theme-junkie are low cost solutions. If you want fully SEO optimized themes then you should use Genesis theme. If you are starting a professional blog, only then you need to think about this. You can hire 3rd party SEO services to do offpage optimization. Price depend upon your own budget. If you are a new blogger then I recommend you to follow SEO guidelines for WordPress and start blogging. WordPress provide you a great list of free WordPress plugins. But there are premium plugins also available. If you don`t have investment issues then you purchase some premium plugins to boost on page SEO optimization. I personally recommend to use EasywpSEO. If you are new to blogging then I recommend you to go with basic setup with a premium WordPress theme. If you do have any question, feel free to ask me. If you like this article, do share on twitter and Google Plus. Don`t forget to subscribe eAskme feed to get updates.